Clearview Expressway, Queens New York - $10.00 : Bob Hoyts Classic Inspection Stickers, Add a Final Touch to your Restoration! 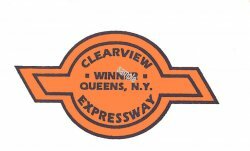 This sticker celebrates this particular area of Queens, where guys would run on the Clearview Expressway, the "Racers" would have their pits on both sides of Union Turnpike under an overpass for the Clearview. Guys would gather under the overpass, or right next to it, and they'd get ready for their race, or just choose up for races they were going to have later that night up above on the expressway itself. A big thanks to Rick for sharing this sticker with us.